This the website for the Student Association of Cinema Studies, a student organization at New York University. In a Season of the Impractical... the Inevitable Has Happened! 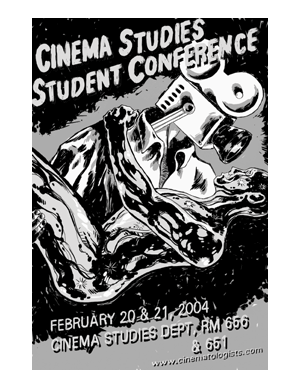 The 2004 Cinema Studies Student Conference was an incredible success. We had close to two hundred students, faculty, and community members attend one or more of the seventeen panels. An archive will be available shortly. In the meantime, you can download our program (PDF, [an error occurred while processing this directive]).